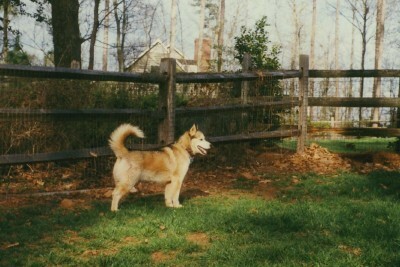 Nikita was my first Siberian and, thus, took it upon herself to be my educator about the deviousness of Siberians. And, trust me, she took this job very seriously. When she was about six months old, we moved to a new house which, of course, meant that we had to construct a new fence. Knowing that she was not a jumper, I felt safe with a four foot fence (see the picture above – yes, I know, let’s just call me a rookie). We had the fence constructed and then started visiting the house to work on the interior which needed to be cleaned up before we could move in. We brought the dogs each time and let Cocoa, Ginger and Nikita out into the big back yard. On our first visit, I released the dogs and watched them run and wrestle. I went inside and began stripping the ugliest wall paper you have ever seen (picture large purple felt swirls). A movement caught my attention. There was Nikita looking at me. Through the glass door. The door OUTSIDE the fence. It had been a minute or two max. How had she done that? I called her inside and let her loose again in the backyard. She ran straight to the back corner of the fence and stepped between the post and the fence of my neighbor. The fencing company had installed the last post with just a few inches gap. But plenty of gap for a Siberian. Grumbling, I went outside and wired in a piece of fencing connecting the post to my neighbors fence. Much too late now to get any more work done so we went back to the old house. I opened the gate, a u hook over the top of the post, and let the dogs inside the back yard. Went inside and started stripping the wall paper. Looked up and saw Nikita sitting outside the glass door. Yes, outside the fence. And looked outside and saw the gate was open. How did she do that? I put her back inside the fence and watched her walk over to the gate, jump up and, with her nose, knock the U hook off of the post. Proudly, she walked out of the gate. Off to Lowe’s. Purchased a double latch for the gate and installed. Went home to the old house. Placed dogs in back yard. She tested the back corner. No luck. She tested the gate. No luck. I relaxed. Went inside. Started stripping ugly wallpaper. Looked out the glass door. Yep. There sat Nikita, with dirty paws. If you can’t go through, you go under. Off to Lowe’s for a bag of concrete. Fill in the hole. (Great solutions for diggers – just pour powder concrete mix in hole, add a little water, stir, and it will set up strong enough to prevent the next digging) Packed dogs up. Went to the old house. Placed dogs in back yard. Tested back corner. No. Tested gate. No. Tested hole. No. Moved three feet down and started digging. Took two minutes before she had enough to wiggle through. Back to Lowe’s. Bought several bags of concrete. Filled hole. Went to the old house. Starting from that point, I now knew to work for a while inside the house and then go outside and look for the hole. It took me a few times but I began to realize to look on the opposite side of the yard from where she was sitting (She figured out not to make it easy for me). Every hole I found and filled with concrete brought howls of protest, but kept her safe and sound. Or so I thought. At least it worked for a few months. We had been in the new house for a few months and Nikita had actually made it to her first birthday. I was getting very confident that I had figured how to keep my escape artist inside her nice, safe fenced yard. Silly me. One morning, after letting the dogs out into the backyard, I came inside and got stuck on the phone. I was running late for work and went outside to get into the car. Out of sheer habit, I did a quick headcount. One, two, er . . . Where was Nikita? Sigh. I started walking around the neighborhood calling for her. And there she was. Playing with her best buddy, a big Boxer. Now the Boxer lived in a yard with an invisible fence. Nikita’s favorite game was running in, tagging the boxer, and then running just outside of the fenceline, turning around and laughing as the Boxer skidded to a stop just shy of a shock (How the devil did she know where the line was?). “Nikita, come here.” Amazingly, it worked, and she trotted over looking pleased as punch but a little surprised to see me. We walked back to the house and I put her in the fence. I walked the fenceline, prepared to fill a hole I had missed with concrete. To my surprise, no hole. Hmm. Who knows? I am really late for work and my white shirt now has nice muddy paw prints. Inside. Changed shirt. Outside. Headcount. One, two, errrr. As I stood there puzzled, a neighbor came walking past. “Hey!” I waved. “Are you looking for Nikita? She is down with the Boxer.” I nodded and sighed. “She is so nice. Comes and visits us every day.” Huh? Every day? Off to the Boxer’s house. Retrieved Nikita. Back to the fence. Back inside to change my shirt. Well, I pretended to change my shirt while I stood and watched. The rascal walked to the back corner of the fence line and climbed out over a stack of logs and over the fence and down the other side over a electricity box. I moved the logs from the corner and stacked the wood on the wood pile (in the middle of the yard. I was not that stupid, or so I thought). Went and retrieved Nikita. Went back inside and watched (I was hopelessly late for work by this point). Nikita went back to her corner. Stood and looked at the lack of firewood in the corner. She shook her head and wooed in disgust. Walked over to the woodpile, grabbed a log in her mouth and dragged it to the corner. Back for a second one, hauled it to the corner, and placed it on top of the first one. The rascal was actually building a ladder in the corner to get out. I called to work and cancelled my day. Spent the rest of the day re-stacking firewood outside of the fence. At the end of the day, exhausted, it hit me that my little rascal was not only smart enough to build a ladder to get outside. She was smart enough to be back inside the fence before I got home from work. She could tell time. Argh. I knew I was totally in over my head. And I knew that I would never have another breed in my life. My life goal was now to outsmart the Siberian mind. Haven’t succeeded yet, but I have won many battles. The next part is not one of those victories. After being outsmarted so many times, I decided that I needed to up the ante in security for my escape artist extraordinaire, Nikita. I decided if the fence itself was not sufficient, I would add an invisible fence just inside the perimeter. That way, she could not work on the fence line while being shocked, right? Off to the store and a few hundred dollars later, I had all of the equipment I needed to install invisible fencing. Dug a trench. Installed the wire. Wired the equipment. This took an entire Saturday and part of a Sunday to do. Finally, satisfied that I had it all installed, I turned the power on and touched the prongs on the collar. A nice mild shock. Turned it up a little, and touched it again. Only when I was confident that it was working, but would not hurt, did I put the collar on Nikita. She walked around the yard wearing the collar and neared the fence line. She jumped. I grinned. Finally. I walked the perimeter one more time checking for openings, and making sure the wire was properly buried. At one point, I heard a buzzing. Turned around. There was Nikita. Sitting on the buried wire. Collar buzzing. And a pleased as punch look on her face. The rascal was enjoying the buzzing. She thanked me for buying her a massage collar. We purchased a new house in 1999 and moved back into the city limits of Charlotte. Nikita had not escaped in a long time and we determined that she would not do so in the new house. It took her a month before she had success. She and Cocoa got out of the yard, but Ginger liked the safety of the yard and never left (found her sitting in front of an open gate whining for her pals). We searched into the evening, had reports of many sightings, but no success. The next morning, I went over to the animal shelter and found both of them. They had been picked up, treated (Cocoa had a cut on her back from some misadventure), and fed while we were out searching. The shelter had found the microchips and was calling us first thing that morning, but I got there before they even called. Paid the fines. Paid the boarding bill for the night. Paid the vet bill. A few hundred dollars lighter, we went home and began building the newest doggie prison. This is by far my favorite story. i can read it over and over again. I’m lucky in that Juno won’t try to escape when Loki is here. She most definitely will when he’s not. she once got through a 6 inch gap between house and fence! i saw her try one night and knew that’s how she got out. We fixed that. we also put in metal caging on our nice victorian trim (dog yard only) because that’s just “funny” fencing for sibes! We have 2 fenced in areas: 1 is about 3000 feet dog yard (with the tree house in it) attached to our house and has a dog door to a mudroom and my office. the seond is a “deer fence” (read, realy weak, not dug down low and most certainly NOT dog fenced) perimeter around an acre of our property that i let them run when i’m supervising. twice when i took loki to school last year and left her plenty of kongs to occupy herself, she escapped the dog yard, but lucky for me, she would greet me at the gate and driving down the driveway or i’d find her sitting in front of the garage doors, smiling, relaxed. Happily prancing doing her thing. I am DAMN lucky she never tried to escape the deer fencing because it can be done. And it’s a busy 40 mile and hour road in the country where people speed like crazy. I’m pretty certain that it was just enough in the 1 acre to occupy her busy mind though (squirels, gophers, digging stuff). that’s when she came back to school with Loki and me. Occassionally i now still leave her alone, very rarely though. typically when i’m doing search training with Loki. and when i do, i leave a VERY large raw knuckle bone for her. i know that means more to her than Loki (ya, she’s more attached to him than me tho she’s my little lover to me)… and the yard is in my opinion 95% husky proof. i think by now the bone is good and her hips probably can’t take the abuse. when we move, i plan to get a car i can take her and loki in for Loki’s training and just leave her in the back (ventilated, harnessed w/door open, like your jeep set up). she HATES the kennel. OMG, it’s like a stigma to her. and it’s been bent from her mouth enough. i really don’t want her ruining her teeth anymore. silly sibe. read this story for the first time and was laughing out loud! the things you learn from your dogs! You’al met Chinook last Saturday (July 24, 2010) in Waynesville. In May I took him camping in my “new”, used motorhome about an hour away for our first adventure. I left him in the air conditioned camper with both doors closed (but not LOCKED), and went to see something for about 20 minutes. When I returned the doors were open and he was gone. Thank goodness he had only been gone about 15 minutes my neighbor said and so some of the campers got into their golf carts and went looking for him. He saw me, grinned and ran the other way. However he did respond to the men in the crts and they brought him back. We were in the country and I was so worried he would be hit by cars on nearby road or not be able to find his way back to me (new, unfamiliar place). Chinook has escaped about 5 other times at home and once came home in a police car (our neighborhood police). Makes me crazy and extremely nervous to take him anywhere. I just think the red’s are the worst for escaping. I couldn’t believe my daughters husky Fire she was a red. The very small holes she could get out of by digging. So concreted or under the fence line it was a wire fence and so fire decided to unhook the wiring along the runner and pushed the wire up and get out. She could open gates too so we found out. I was also our first experience with a husky. I, too, have read this before, and it truly is funnier the second and third times. I am looking forward to reading more of the historical (hysterical?) posts. Thanks for making my mornings fun! haha this is a great read, so pleased you are resharing these. I think we all learn from our first Sibes, although I have to say my 2nd has been the worst for escaping, luckily the 3rd, so far, is not brave enough, or we just have it sorted after Khumbu’s many escapes over the years.